Offering you a complete choice of products which include automatic incense stick packing machine and incense weighing and packing machine. We are identified as one of the leading names in the market engaged in providing a wide range of Automatic Incense Stick Packing Machine to the clients. Skilled quality checker team test this offered products on various parameters to make certain the good quality. 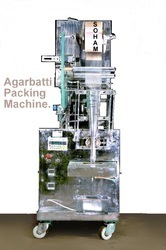 Apart from this, these machines automatically complete the process of weight and packing of Agarbatti. Auto stop when raw incense is finished.